Had an interesting talk with a friend of mine. It was based on religious beliefs vs the existence of the yowie. My friend is a devout Christian and very dedicated to the teachings of the church etc. Anyway, we got onto the topic of belief in the Yowie. I mentioned my interest in the subject and I mentioned evidence, reports both here and overseas . What I got in response was quite amazing. Basically he stated that there was no room in the belief system for a Yowie to exist. Period. He politely told me that man ( Homo sapien ) was the apex species and this planet was made for the sole purpose for his/her experience. Now before this goes down a religious path let me remind you that there are plenty of people who are Christian, Muslim, Buddhist whatever who have open minds. So this is not so much belief but an arrogant approach to what man stands for and is entitled to. He worded that a Yowie is our competition and should be rejected. I thought about this conversation a lot afterwards. Not sure how to process it. I come from a similar background but I would see such a discovery would be a wonderful thing for our world...not something to shame and destroy. ChrisV wrote: Had an interesting talk with a friend of mine. I too have Christian beliefs and believe me there are a lot of Christians who will side- step this debate completely especially when I put forward my views even to the point where I'm not welcome. With due respect to your friend he either wants to avoid the discussion or may not understand the scriptures I personally think it is the former. The Church basically does not want to talk about Bigfoot, Yowies, dare I say Dogman. I think they know what it's about but not willing to discuss it. After reading your above post, I hope you don't mind me saying this but his approach is not so much arrogant but lets say a bit stubborn in thinking, henceforth his maybe lack of understanding to other phenomena. Much of what is preached in churches today doesn't cover the big subjects such as Giants, Fallen Angels, Demons, and much much more, of which, IMO all has a lot of merit. Unfortunately adversaries have broken the church and proper teaching down. And because of this pastors/clergy don't know how to teach it or its seen as less important, irrelevant is some eyes, and henceforth its forgotten..... unfortunate I think. There are many things I believe in and have an open mind too, Christianity falls short in many areas but it also provides vital clues to life's mystery's and an honest base to good living, faith and hope to the lost. I have Spiritual and Christian values which the church doesn't teach. Maybe you could try and point him towards the audio files on YouTube and see what he thinks then? Beat me to to it senses, I have tried to bringing the subject up to a few people/churches (twice) and its usually meet with a strange look, but welcoming outlook to teach a different agenda. I recently heard Duke (Brian Sullivan) theorise that disclosure will never happen because it will VALIDATE scripture because giants, nephilim, etc ARE in the bible. Not saying I agree with this statement but it is an interesting thought. I agree with what has been said above. The church today is a complex organism that has suffered the infiltration of human and spiritual fallacies. A lot of the supernatural has been removed from the views of many Christians. That's a strange thing to say but nevertheless true. Only certain types of supernatural events are acceptable, specifically those that relate to the gospel. Consideration of anything else is passively and sometimes actively discouraged. 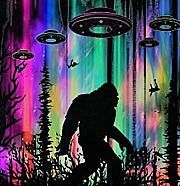 Topics like UFOs, Abductions, Giants, Nephelim, The Watchers, The Divine Council, parallels to religious beliefs of contemporary ancient cultures, Bigfoot/Yowie, Mythology in general and many more are just flat out avoided. A lot of Christians today would not know the first thing to do if they experienced a supernatural event, let alone a possession or oppression. They have watered down the teachings of the early church with safe alternate explanations for things that deny certain supernatural themes that were well known to Christians and Jews at the time of the birth of the Church. Because of this the faith of many people is not robust enough to withstand any new information and you get statements like "there was no room in the belief system for a Yowie to exist. Period." Sorry but that is just ridiculous. Unfortunately that is a feature of the times we live in and I try not to get bent out of shape about it. It will all be revealed one day and some people are in for a rude shock I think. That's quite surprising mate. Even hardliner Evangelicals will at least consider the " Sasquach might be relic Nephilim" argument. avoids the Darwinism argument. Not to mention in the epic of Gilgamesh a "squatch" being his best mate, the huge and hairy "Enki" . I know a few christians who have no problem accepting the yowie and know quite a bit about them. Their views are similar to Seasonfires. They are not affiliated with any particular church. Just believers who have there own faith but know the bible quite well. A lot of the supernatural has been removed from the views of many Christians. That's a strange thing to say but nevertheless true. Only certain types of supernatural events are acceptable, specifically those that relate to the gospel. Said -opaths then proceed to make sure 'acceptable' events relate to carefully chosen gospels. The others are ignored or pushed aside to suit the power structure and The Powers That Think They Be. If said PTTTB decided it suited their interests to announce Homo Nocturnus' existence any gospels mentioning Giants etc would be pulled out, dusted off and 'preached' to the masses. Thanks guys for all your responses. Very interesting and there seems to be like minded people here that share my views. Yes I find the whole dismissive approach shallow. As what was pointed out - it will only take one discovery or an experience from someone like my friend to shift the whole picture to one of acceptance...at least in theory. Its also this perspective that creates division within our own society - racism, nil tolerance for sexuality differences etc etc. I also spoke with said friend about the Tassie Tiger situation - the sightings, reports and the distinct possibilities that it could still be alive. That conversation was met with "Wow - would'nt that be great if that was the case! " There is room for some freethinking in christianity, but I think it's fair to generalise here and say religion or strict adherance to any particular belief structure, is not condusive to free thought. To believe in something is to reject all other alternatives. People find comfort in religion and systems of belief. It absolves them from having to think anymore and ties up the loose ends. There is nothing more frustrating than trying to have an open minded conversation with a closed minded person. It's a waste of time and because I don't want to run around collecting assault charges, I just dont bother anymore. Tim* wrote: There is room for some freethinking in christianity, but I think it's fair to generalise here and say religion or strict adherance to any particular belief structure, is not condusive to free thought. I agree. The belief system replaces the need for you to question anything - yourself included. I think belief in certain principles or standards of behaviour is a positive social force; but as Joseph Campbell has said the issue with religion arises because people become fixated on the denotation instead of the connotation. The Power of Myth is well worth a watch in its entirety. Christians of course believe in God and they also realise you can't have God without acknowledging his created combatant-Satan. They do indeed find comfort in their religion and rightly so and as far as them not having to think anymore; they know that God has protected them against anything Satan can throw up so they are quite justified in rejecting anything that they perceive as ungodly. I personally hold very strong Christian beliefs but am interested in furthering the research into some of the unanswered questions that scripture may put forward although for me the further I studied the more the answers were revealed. Tim said: There is nothing more frustrating than trying to have an open minded conversation with a closed minded person. It's a waste of time and because I don't want to run around collecting assault charges, I just dont bother anymore. So true Tim but I find the reverse situation with those who are transfixed on science/palaeontology to solve all their queries. They would never accept a biblical explanation in a million years. I've used the Christian Bible as my reference, supported by the Books of the Dead Sea Scrolls (non- Christian) and the Book of Enoch - although not included in the Books of the Bible there are still detailed extracts. From what I have learnt from science and what I have discovered in the Bible, to me, one has the answers the other doesn't so obviously I am on the Biblical explanation but always open to any scientific data. For me personally it's a question of how information was obtained. It's true that ancient, traditional stories contain anecdotal information which is of great value - but if it can't be verified objectively then it remains anecdotal. It's like traditional medicine - I swear by Chinese medicine, but I know it's a traditional form of medical care and I combine it with 'normal' medical advice and pharmaceutical medicine from a GP or specialist. I wouldn't solely rely on either but accept that they both have different things to offer. I wouldn't totally discount traditional knowledge because it's not 'scientific', but I wouldn't solely rely on it as a source, either. I would try and balance out the two and attempt to determine which parts of both I can use to further my own knowledge. It's like different software systems - they run on different platforms. Science is one shell program that runs on one type of code, religion/tradition/spiritual knowledge or 'received wisdom' runs on another code. They both have their uses but you can't always easily transfer files from one platform to the other. A healthy approach to everything in life Simon. I'm a Christian and I have no problems with the existence of the Yowie and it's cousins around the world. MW83 wrote: I'm a Christian and I have no problems with the existence of the Yowie and it's cousins around the world. I suppose the discussion centres around people who are more fundamentalist in their views - there's plenty of scope for a wide range of different interpretations within any religious context. It's a question of degrees. I was baptised Church of England but only go to Church for weddings, funerals and Christenings, but Christian values have influenced my thinking and overall worldview without any doubt. I wouldn't identify myself as a Christian specifically, but I do think religion can be a positive social influence without people being overt about it and including/excluding people and ideas based on religious doctrine. Hi MW83, I think a lot of Christians may know about Yowies/Bigfoot but at the same time quite a few don't; however, it's when you get down to the detail that they either look perplexed or an opinion of you shouldn't be going there and that viewpoint I can understand. I dont think we should pidgeon hole all Christians together. Theyre rather varied from my experience. I worked for a lady today who is a christian. She knew a lot of Aboriginal spirit stuff too. She told me that yowies can turn into other animals that they use as sentinels to watch out for trouble like humans for example. A freind was telling me last week that a relative had a yowie encounter. She said she believes him as hes a good person and a Christian and isnt into that sort of thing. Just a few examples anyway. Audio Report #111 - in which Nuns are amongst the eyewitnesses - seems an appropriate one to mention in this thread. It's easy for a christian to simply say they believe in Yowies. But it's not that simple, it's just words. How does a relic hominid fit into the picture? What of their spiritual condition, were they created, like us, in the image of God? This is a huge mountain to climb for most and challenges the anthropocentric view of western religion that humans are Gods 'chosen' ones. If you accept that the yowie is a relic hominid, one way to approach it is to look at how christianity approaches the discovery of the Neanderthal. Opinion is hugely divided and a struggle to fit into a religeous framework. Tim* wrote: It's easy for a christian to simply say they believe in Yowies. But it's not that simple, it's just words. I think its very important for people to keep an open mind regarding all things that may enter the picture. I mean you can have your beliefs - but what happens when something like a UFO lands, a bigfoot is discovered etc etc....we just can't say its evil and has to be destroyed!? It that kind of thinking that creates competition, anxiety, phobias etc. That's true,because then you would be a Scientologist! Yes lets all be open minded about everything...except Christianity and religion of course. But thats ok as they can handle it and have put up with it for thousands of years. Yes to many Christians, they are just words - but to others they are not. There are a lot of scientists who are Christians because of the evidence they see in nature when they study it extensively and minutely. Britain's foremost atheist, Dr. Antony Flew - emeritus professor of philosophy at Britain's Reading University, recanted his position in 2005 because of the evidence provided by DNA, being that it is like a computer code so complex as to require an intelligent designer. He did not become a Christian but he would probably have best been described as a Deist and was simply following where the evidence led after previously championing atheism for more than 50 years. It was scientists around the world that created and championed the intelligent design movement based on evidence from their collective studies. In regard to relict hominids or hominoids for that matter, I personally believe the entire field is a house built on sand. They pay not heed whatsoever to the fact that the sum total of the "supposed" evidence for different genus/species could fit in a single room. Sometimes an entirely new species is concocted simply from a few teeth. This is the poorest form of enquiry and has more in common with expressionistic painting and fairy tales than it does with real science. It would be equally valid to suppose that there were bipedal apes in existence since the creation of the world and this together with natural (and still visible today) variation in the human population accounts for some of the more manlike variations proposed - that is if they are actually recreated correctly from the flimsy amount of evidence available. This would certainly fit more accurately with historical accounts of such things from the very earliest of civilisations, something which science gives little credence to, claiming they are mythological and incorrect. So why struggle to fit suppositions about the Yowie/Bigfoot into a flawed human evolutionary tree construct? Seems like a pointless exercise to me. The way I see it is there is no challenge to the anthropocentric view since there is no valid evidence to the contrary, only badly constructed fables and mere supposition in the case of the Yowie/Bigfoot because where they are concerned, speculation reigns supreme and real evidence such as a specimen, detailed behavioural studies and tests of supposed intelligence just do not exist. I am happy to wait and trust in a faith that has stood the test of time and every criticism thrown at it over thousands of years. Unfortunately those Christians who do not hold true and seek to compromise with the straw man of evolution will be found wanting in the end. Some people do not understand the Christian doctrines, I certainly don't understand all but if you genuinely look for an answer to a question you will find it. While everybody is quite comfortable using terms such as the Church, Christianity and even occasionally God there is, however, one word that seems forbidden - SATAN. The Bible continually refers to Satan, you can't have God without his adversary Satan. If you can't accept this you will never find answers to such questions regarding UFO's, so called Aliens, Bigfoot, Dogman and a myriad of other cryptic creatures. I am unapologetic in believing these are the works of the Fallen Angels (The Watchers) and Satan himself controversial to some but I believe this to be the case. As I've said before if you don't want to accept a Biblical explanation go and read ''The Book of Giants'' in the Dead Sea Scrolls scripts you cannot accuse of being Biblical. Alternatively, the Book of Enoch. Most Christians are probably aware of these creatures and they are also aware they are not from God. It is highly unlikely that they will ever be confronted by a rampant Bigfoot, Yowie or Dogman and if they were they would know how to deal with the situation. If you continue to search out your answers through science I'm afraid you will be like a voice in the wilderness. Great posts there by both Trevor and Sensesonfire. Some real food for thought and good reading. Its a credit to the forum members who have posted that this thread which developed from a real life conversation between Chris and his mate, hasnt degenerated into a total s#@tfight. I cant say the same if i bring the subject up at a family gathering ill be attending this weekend!